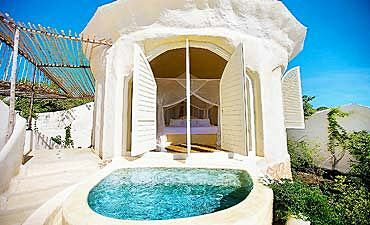 Are You Planning An Africa Trip To Zanzibar In Tanzania? 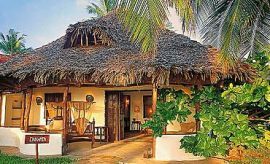 Scroll Down..
An exquisite jewel set in the Indian Ocean, about 23 miles off the east coast of Tanzania, Zanzibar or the Spice Island is a laid-back little settlement where history whispers to you as you wander through its narrow winding streets on your dream vacation in Africa. A treat for the senses, this archipelago delights you with its pristine white sand beaches, turquoise blue ocean waters and the brilliant green of the seaside vegetation that houses diverse species of flora and smaller fauna. Here, the soft ocean breezes caress you as you bathe in the gentle warmth of the tropical sun while the scents of spices and fresh fruits send you back to a bygone era. Beautiful, carved artifacts and delicate jewelry line the petite shops and you can see the exquisite craftsmanship reflected in the lovingly fashioned Swahili doorways in the Stone Town section that is also a UNESCO World Heritage Site. The sounds of ancient muezzin calls, church bells, amused children, pounding spice mallets, chirping birds mingling with the songs of fishermen create a lively ambience around you. Sample the outlandish tastes of the freshly caught fish seasoned with fresh herbs and spices or view their brilliance in their natural setting when you go angling in the deep, blue waters. As you will find, when island hopping off the coast of Tanzania with AfricanMecca, it is a collection of large and small islands, the Unguja (a.k.a Zanzibar) and Pemba Islands being the larger ones among them. The smaller islands include Chumbe, Mnemba, Tumbatu, Chapwani, Bawe and Changuu or Prison Island. Murogo while Pange and Nyange are some of the sandbank isles. You could also visit the northernmost section of Zanzibar Island where you can watch traditional dhows being fashioned in front of you. The beachfronts are located in the northern, eastern, southern and small parts of the western regions close to Stone Town. But Zanzibar has yet another treat in store for you in the Jozani Forest Reserve. A must visit wilderness while touring for primates in Tanzania, you will be able to view kirk’s red colobus and sykes’ monkeys to name its prime creatures. Visit this little corner of Eden and revel in its incredible beauty. 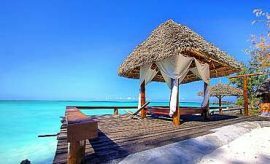 Arrive at Zanzibar on your beach holiday and you will be enchanted with its idyllic natural beauty where the sun gently caresses the white powdery sands as the turquoise water of the Indian Ocean create a striking contrast. The warm waves, tamed by the coral formations, bring the vital nutrients that support the brilliant rainbow colored fish that dart among the reef vegetation. On shore, lofty coconut palms sway in the breeze, tempting you with their succulent fruit drink and white soft flesh. As you relax on your beachfront lounger or on a hammock strung between the trees, you might spot a weaver bird or green wood hoopoe with their brilliant colors and distinctive calls flitting among the branches. 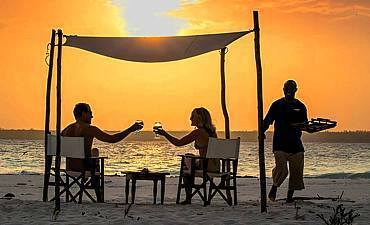 From the eastern to southern seashore expanses, Zanzibar has varied picturesque white beaches, each rivaling the other in tranquility and allure with names that are fascinatingly exotic like Kiwengwa, Pongwe, Uroa Michamvi and Bwejuu On the west in Menai Bay, you will find the Fumba Beach that will surprise you with its golden sands along a backdrop of screw pines and palm trees. 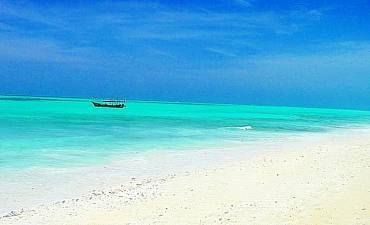 The finest of the beaches in Zanzibar traverse from Kendwa in the northwest to Matemwe in the northeast. The prime midpoint is the Nungwi peninsula on the northernmost tip. You will be enchanted by the sight of banana palms, mangroves and coconut trees. Nungwi village has a reputation for its traditional dhow building industry. 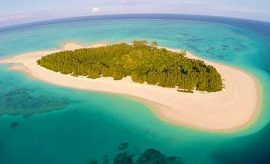 Mnemba Island and its marine reserve atoll are only a short boat ride away from Matemwe Beach. The coral reefs and pristine clear waters of Mnemba Atoll are truly breathtaking. And if you are a dolphin lover, travel to the southwestern Kizimkazi region of the island and be delighted by its sightings including migrating whales too if you are lucky. 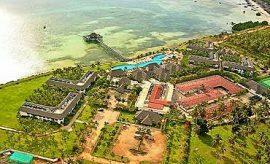 AfricanMecca can also organize visits to the many outlying smaller islands during your exploratory trip to Zanzibar, each with a trace of history to it. 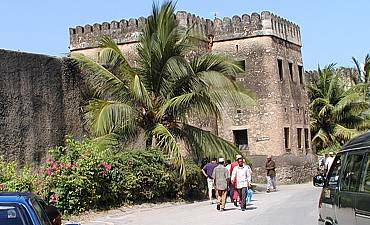 For instance, at a short distance from Stone Town is Prison Island or Changuu where the Omani housed their slaves. Later, the area was used by the British to build a jail thus its christened name. A silent testament to the events of the isle, you will still find the aging 180 plus year old Aldabra tortoises, a gift from the former colonial occupiers of Seychelles, lumbering among the greeneries on Changuu. 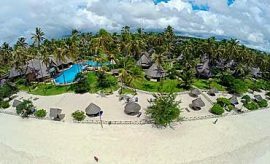 Also visit the islands of Bawe, Chumbe and Chapwani. A UNESCO World Heritage site, the Stone Town is Zanzibar’s capital township with a rich historical and cultural significance. Even after hundreds of years, it has retained all its original ancient charm that time has not been able to erode. 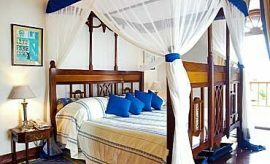 Even today, when you visit this buzzing traditional metropolis on your seaside vacation in Tanzania with AfricanMecca, you will be transported back to an era where the Omani monarch eloped through the narrow alleyways, lined with coral stone houses, their peeling plaster and lichens only adding to their ancient appeal. You will chance upon clusters of elderly wise men, languidly spending time reminiscing about their past days over cups of kahawa (coffee) bought from the wandering vendors. Children play around, their laughter mingling with the giggles of young girls absorbed behind the conservative latticed windows while bui bui women return home from shopping at the local market. Stone Town is also the commercial hub of the island but still set in a yesteryear era. Here, you will find many small dukas (shops) that sell you wonderful entities like colorful textiles, spices, fresh fruit and delectable seafood, carved curios, artwork and pretty trinkets. Subtle modernization is slowly making its presence felt and should you need to contact home while traveling in this part of Eastern Africa, you can find little internet cafes or tiny stalls that sell you postcards and mobile phone top-up cards. You could also sample some of the local Swahili cuisine available at Forodhani Gardens in the evening or at local eateries to the sound of cheering from an excited group of international football fans following a European soccer league on a tiny TV perched on a pile of old cartons. Here and there, when touring around Stone Town, you will find colonial style buildings standing shoulder to shoulder with Swahili houses proudly advertising their origins with their intricate carved and varnished doors. Medieval mosques, churches and hindu temple meld perfectly together in harmony as do the Portuguese Fort and their cannons with the Sultan's Palace Museum (Beit-el-Sahel) and House of Wonders (Beit-el-Ajaib). Brightly-colored window panes sparkle in the sunshine while the soothing sounds of Kiswahili chants follow you as you explore this ancient town that overlooks stylish, sleek liners cruising the vast Indian Ocean. This is Zanzibar Stone Town for you, alluring, enchanting, an authentic coastal settlement that you will want to return to, time and again.